Dramatic scenes unfolded when a 46-year-old immigrant man was arrested and taken to jail, after hurling stones at the windows of the Norwegian Parliament. Police had to scramble to the Parliament on Thursday, after stones were thrown at the parliament building. - We have a patrol on site now. 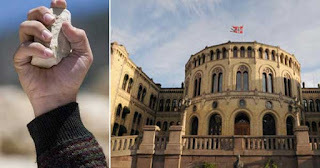 A man threw stones, operations manager Finn Belle of the Oslo police told TV 2. Six windows were shattered by stones. The circumstances surrounding the incident are unknown. - A 46 year old man of foreign origin has been arrested and taken to jail, said Belle. Adviser Bjørn Inge Bergestuen of the Progress Party became aware of the incident shortly before police arrived at the site. He took out his mobile phone and filmed when police investigated the bag of the man who was arrested, he told TV2. Eyewitnesses to the arrest told TV2 that there were relatively dramatic scenes unfolding. Security guards came running from the entrance when stones were hurled at the windows, and they dragged the man into the Parliament. After a few minutes police arrived and transported the 46-year-old to jail.